Below you fill find all funeral homes and cemeteries in or near Mesa. Mesa is also known as: Mesa Patios, Mesa Patios, Arizona, and Maricopa County / Mesa city. Their current mayor is Mayor John Giles. Zip codes in the city: 85201, 85202, 85203, 85204, 85205, 85206, 85207, 85208, 85209, 85210, 85211, 85212, 85213, 85214, 85215, 85216, 85274, 85275, 85277. Maricopa County funeral flowers can be purchased from one of the local funeral shops we partner with. Mesa has been featured in films like: Excess Baggage (1997), Bill & Ted's Excellent Adventure (1989), The Kingdom (2007), and Never Been Thawed (2005). Some of the notable people born here have been: Danielle Fishel (actor), Todd Heap (american football player), Rodney Peete (american football player and actor), Pete Mandley (american football player), Bart Oates (lawyer and american football player), Brian Jennings (american football player), and Raonall Smith (american football player). Mesa (/ˈmeɪsə/ MAY-sə) is a city in Maricopa County, in the State of Arizona and is a suburb located about 20 miles (32 km) east of Phoenix. Mesa is the central city of the East Valley section of the Phoenix Metropolitan Area. It is bordered by Tempe on the west, the Salt River Pima-Maricopa Indian Community on the north, Chandler and Gilbert on the south, and Apache Junction on the east. 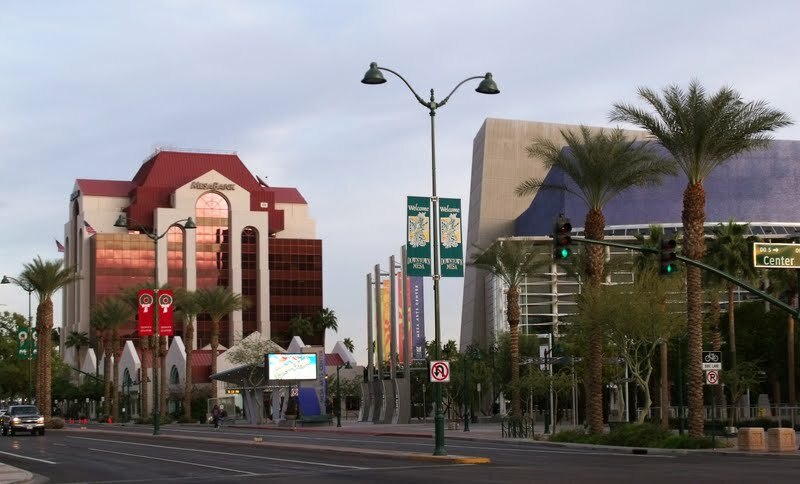 As of the 2010 Census Mesa became Arizona's center of population.Mesa is the third-largest city in Arizona, after Phoenix and Tucson, and the 38th-largest city in the US. The city is home to 439,041 people as of 2010 according to the Census Bureau. Mesa is home to numerous higher education facilities including Polytechnic campus of Arizona State University. It was revealed on March 26th, 2019 that M Paul Mullowney died in Mesa, Arizona. Mullowney was 86 years old. Send flowers to express your sorrow and honor M Paul's life. It was disclosed on March 3rd, 2019 that Judith A White (Koch) perished in Mesa, Arizona. Ms. White was 76 years old and was born in Peoria, IL. Send flowers to share your condolences and honor Judith A's life. It was noted on January 27th, 2019 that Robert Harold Reilley perished in Mesa, Arizona. Reilley was 81 years old and was born in Chicago, IL. Send flowers to share your condolences and honor Robert Harold's life. It was written by The Mail Tribune on January 26th, 2019 that Mildred "Lenora" Kirklin (Davis) perished in Oregon. Ms. Kirklin was 81 years old and was born in Mesa, AZ. Send flowers to express your sorrow and honor Mildred "Lenora"'s life. It was noted on January 21st, 2019 that Norma A Page (Kew) passed away in Mesa, Arizona. Ms. Page was 89 years old and was born in Skaneateles, NY. Send flowers to express your sympathy and honor Norma A's life. It was revealed on January 18th, 2019 that Rosalia Antonia "Rose" Riccobono perished in Mesa, Arizona. Riccobono was 47 years old. Send flowers to express your sympathy and honor Rosalia Antonia "Rose"'s life. It was reported on January 17th, 2019 that Ronald Robert Soos perished in Mesa, Arizona. Soos was 81 years old and was born in Chicago, IL. Send flowers to share your condolences and honor Ronald Robert's life. It was revealed on January 12th, 2019 that Edith Mae Greatsinger (Kingston) died in Mesa, Arizona. Ms. Greatsinger was 84 years old and was born in Pillsbury, ND. Send flowers to share your condolences and honor Edith Mae's life. It was noted on January 2nd, 2019 that Calvin Kennedy Smith passed away in Mesa, Arizona. Smith was 90 years old. Send flowers to express your sorrow and honor Calvin Kennedy's life. It was disclosed on December 18th, 2018 that Thomas M Kendall passed on in Mesa, Arizona. Kendall was 64 years old and was born in Peoria, IL. Send flowers to express your sympathy and honor Thomas M's life. iMortuary covers all Mesa funeral homes and funeral services, just browse below for funeral planning services throughout Mesa and Arizona. From finding the right funeral director to sending funeral flowers to any of the funeral homes within the US, we can assist with all your funeral home needs. Mesa funeral planning is made simple through searchable listings of every Mesa funeral home. Let us help you in your search for the right funeral provider, from cemeteries to cremation providers, we are the authority on funeral homes in Mesa. Mesa, Arizona is the third largest city in the state and the home of Arizona State Universities Polytechnic campus. Despite being a very populous city, it is mostly a suburb community with residents commuting to nearby Phoenix and Tempe if not working in Mesa. The largest employers for the city of mesa are public schools, government, Boeing and healthcare. Amenities for Mesa residents include a diverse selection of dining and cultural events and activities, keeping the town in the bedroom community demographic. The official website for the city of Mesa is http://www.mesaaz.gov. Listing all funeral homes in Mesa, Arizona so you can easily send flowers to any location (same day delivery) or find any funeral service. Funerals in Mesa, AZ on Yahoo! Local Get Ratings & Reviews on Funerals with Photos, Maps, Driving Directions and more. Local business listings / directory for Funeral Homes in Mesa, AZ. Yellow pages, maps, local business reviews, directions and more for Funeral Services in Mesa, AZ. Sonoran Skies Mortuary, a Funeral Home in Mesa AZ offers compassionate service, personalized funerals, Traditional Funerals, Cremations and Veteran's Funeral Services. We work with local florists and flower shops to offer same day delivery. You will find budget sympathy flowers in Mesa here. Our funeral flowers are cheap in price but not in value.